Thank you for your letters, some of which give me inspiration to write about a particular subject. I try to bear in mind the subject must be of interest to as many of you loyal readers as possible. One came from a group of women who volunteer to provide flowers for a church all through the year. I was pleased to read they are going to grow the plants themselves. They are prepared to buy flowers during the winter but want easy-to-grow flowers from July until autumn. What would I suggest? Simple: dahlias. It’s great to hear from you and as you can see, I welcome any subject you would like me to write about. Yes, dahlias are the answer. The tubers are available at your garden centre in colourful packs with pictures on the front. Take your glasses to be sure the dahlia you like best will grow to the height you want. It’s too early to plant dahlias outdoors so plant the tubers in pots of potting compost in the greenhouse or on a windowsill. In a couple of weeks shoots will appear and it is easy to take cuttings from the shoots. The plants can be planted in the garden after May 21 if you live in Portsmouth. But if you live ‘over the hill’, there could be frosts right up to May 21. There is an old saying: count the number of fogs in March (we had two at Waterlooville) and this will give you the number of frosts in May. Another old saying is: when the hawthorn where you live has finished blooming there won’t be another frost where you live. If you’re not sure what hawthorn looks like, it is also called the bread and cheese plant. It is thorny and grows all over Portsdown Hill. I mention this because Michael, who lives at Cowplain, and Felicity who lives on top of Portsdown Hill have asked me about frost dates. Dahlias. There are decorative, cactus types, giant blooms and pom pom varieties. The latter are popular for arranging, but my favourites are the water lily types. 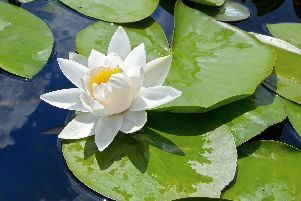 Look for the water lily bloom flower pictures on the front of the packets. There are reds, yellows and pinks and they are wonderful. Dahlias flower from the end of June until frost arrives in November. They are perfect for decorating a church for weddings and baptisms. They flower their socks off and are the cheapest and best of cut flowers. One last tip. Choose yellows and whites in dark areas of the church, but add orange for a wonderful contrast. In the brightest areas of the church use reds, oranges and yellows. A glint of sunshine will brighten the arrangement and oddly enough the same applies in the garden. In long thin gardens plant the yellows and whites at the bottom of the garden with reds and oranges nearest the house. Have a go and you’ll see what I mean. Just brilliant. Daffodil and tulip leaves are a nuisance when planting out summer flowers and you won’t be the only one tempted to pull them off. Please don’t. The quickest way to encourage spring bulb foliage to die down naturally is to remove the dead flowers and seed head. The stem then dies down naturally and all the elements in the flower stalk return to the mother bulb.